A motorcycle accident recently shut down a section of the intersection at East Alameda Avenue and South Monaco Parkway. Police investigators said that at least one person was seriously injured in this wreck. There’s no word, as of yet, to the cause of the crash and no citations had been issued as of press time. As Spring time comes into full blossom, Colorado begins to see a shift from cold-weather travelers to folks who like to get out on two wheels and ride more freely. With that feeling of freedom and mode of transportation, comes the additional concern of keeping an eye out for cyclists. Distracted Driving – Drivers who aren’t paying attention to the road and texting, chatting, emailing, or gawking at something out the side window will pose a significant danger to motorcyclists as well as pedestrians and other motorists. Turning Vehicles – Vehicles turning at intersections rank up there as one of the top spots for motorcycles to encounter collisions. Drivers often make careless turns at intersections giving very little time to paying attention to oncoming traffic, especially smaller two-wheeled vehicles. Impromptu Stops – Hitting on the brakes in front of motorcycles is another dangerous situation waiting to happen. It’s harder for motorcycles to respond to panic or spontaneous stops, because they can only rely on front brakes, which accounts for 70 percent of their stopping power. It can also send the driver over their handlebars, if they lock-up their brakes. 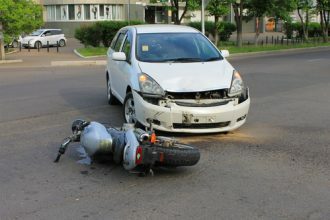 Motorcycles that have anti-lock brakes will help lessen the likelihood of this type of mishap. Sand or Gravel on Road – Some states (like Colorado) put sand, salt and gravel on the road for additional traction during the winter. This additional material on the roads basically makes gripping the road impossible at times for motorcycles. It often leads to unpredictable crashes too. Speeding through Corners – One of the funnest things for those motorcyclists who love the thrill of speed is hitting corners at a high rate of speed. New riders are most at risk of the danger of laying their motorcycles down hitting a corner going at a high rate of speed. Car Doors Opening – This is especially a problem when motorcyclists are riding in pairs and someone opens a door on the side of the street in cities. It is also thought to be dangerous due to jealous or inconsiderate drivers, who don’t like that lane splitting is legal. Changing Lanes – When motorists don’t look in their blind spots they can miss motorcyclists, bicyclists and other vehicles. When vehicles change lanes and motorcycles are behind and an accident occurs, it’s the motorcyclist who is injured and encounters the most damage. Rear-End Collisions – At least cars have seatbelts and strong frames to absorb most the impact. Motorcyclists that are rear-ended tend to not do so well. Sometimes this is even more dangerous in slow-moving traffic due to the fact that drivers will pay very little attention at slower speeds. Bad Weather – Riding in the rain is one the worst things a motorcyclist can do. There’s less traction, water can obscure holes and cracks in pavement, and riders can get drenched. Obviously, in Colorado it’s highly advised that riders leave their motorcycles in the garage unless they’ve spent some time watching the forecast and have proper cold-weather equipment. Drinking & DUIs – It’s a lot easier for motorcyclists to lose control of their vehicles when they are impaired on two wheels versus four. Motorcyclists also have a long storied tradition of meeting at bars, especially for rallies that hop from one bar to another. Motorcyclists need to follow the same no-drinking mindset as other motorists. If you have been injured in a motorcycle or car accident, it’s time to contact a trusted Littleton car accident lawyer at Bahr, Kreidle & Flicker. Since 1983, our attorneys have been fighting on behalf of injured people and aggressively standing up against injustice, inequality and intolerance. For a free initial consultation, call us at (303) 794-7422 or email us using the contact form on this page. 1“Motorcycle wreck closes Denver intersection” published in 9News, April 2016.